Welcome to the Kingery Road Resort and Casino, the galaxy’s premiere vacation destination. Stop by the casino, take a stroll down to Shenanigans or visit the famous Saley, Onks and Liddle for a trip you’ll never forget. Just watch your step, because if you cross the boss, the Kingery will chew you up and spit you out, a broken shell of what you once were. A full-cast, serial, ongoing sci-fi crime drama. Seminar is a sci-fi anthology show where featured shorts, spanning genres and styles, are heard through the lens of lessons in a futuristic post-apocalypse. What do you do after death and destruction have befallen the earth, and turned it into a smoldering wasteland? You listen to Johnny Franks on Active Radioactive Radio! Because... what else are you gonna do? A full-cast sci-fi comedy/variety show audio drama formatted as an in-world radio show. He’s a cop, she’s a reporter; they’re both terrible at their jobs! Undomesticated sea fowl, high fashion and low expectations! Romeo and Juliet have nothing on these two. A short-format comedy audio drama. "The Pendant Shakespeare aka The Wild Bill Variety Show" is an ongoing presentation of the works of William Shakespeare. Chronicling the production of the upcoming Archer and Armstrong audio drama from Pendant Productions and Valiant Entertainment. Chronicling the production of the Phantom Canyon horror western audio drama from Pendant Productions. An original, aerial sci-fi action/comedy adventure serial audio drama, done as an homage/spoof of OTR! Daring test pilot Dixie Stenberg leads a motley squadron of pilots to battle a shadowy Nazi nemesis at the height of WWII, with robots, rayguns and moxie to spare! "Genesis Avalon" is a serialized, full-cast audio drama adventure with one new episode every month. There’s a new superhero in town, but she’ll have to learn to save herself before she can save anyone else. A complete 50 episode superhero show incorporating mythology, Artuhrian legend, and elements of fantasy. A blind woman has a premonition of an assassination, but can’t remember the details of her own life! How are the two connected, just who is Jayne? A full-cast serial audio drama. A troubled girl is caught in the war between Heaven and Hell, and learns she is humanity’s only chance at survival. A serialized, full-cast fantasy audio drama. If fairy tales came to life, there’s only one place that they could find a home… Las Vegas! A full-cast serial audio drama. Carla, the sole benefactor of her detective uncle’s will, travels to Red Sands to sort through his affairs… and soon discovers that all is not as it seems in the town. Did her Uncle jump from Red Sands pier or was he pushed? Only his pile of dicta-phone tapes and his infatuated assistant, Tiff, can help solve the mystery… and maybe avenge his death. A full-cast, four episode audio drama. A slice of life mini audio drama following four geeky people. 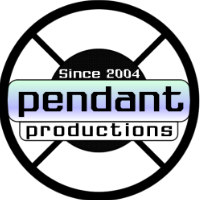 More news about Pendant Productions than you can shake a stick at! Casting calls, preview trailers, interviews and more!